BAIKONUR (Kazakhstan), Russia’s Proton-M carrier rocket has successfully put a Mexican telecommunications satellite into orbit, a spokesperson for the Russian Federal Space Agency Roscosmos said on Wednesday. 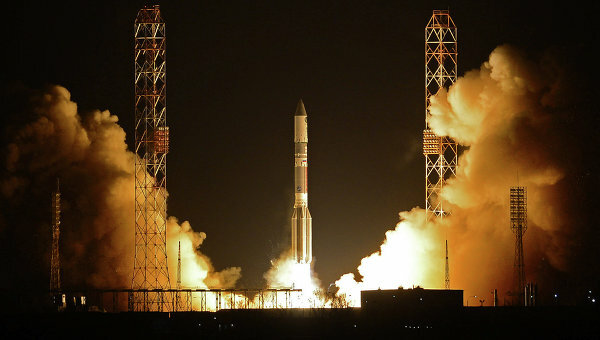 The Proton-M carrying the Satmex-8 satellite blasted off from the Baikonur space center in Kazakhstan at 23:06 Moscow time [19:06 GMT] on Tuesday, Roscosmos said. “The separation of the spacecraft from the Briz-M booster has taken place, and the spacecraft has been handed over to the management of the client,” the Roscosmos spokesperson said. The launch of the Satmex-8 satellite was initially scheduled for December 27 last year, but was postponed following problems launching the Yamal-402 satellite, caused by a glitch in Proton-M’s Briz-M booster. Satmex-8, operated by the Mexican company Satellites Mexicanos S.A. de C.V. (Satmex), is a high-power C and Ku-band satellite that replaces Satmex-5 and will provide Fixed Satellite Services (FSS) in both North and South America.The new satellite, which has a service life of 15 years, will augment the current Satmex fleet in providing services such as broadband, voice and data transmission and video broadcasting. BAIKONUR COSMODROME, Kazakhstan, March 27, 2013 – International Launch Services (ILS), a leader in providing mission integration and launch services to the global commercial satellite industry, today announced that it has successfully carried the Satmex 8 satellite into orbit on an ILS Proton launch vehicle for Satélites Mexicanos S.A. de C.V. (Satmex) of Mexico City, Mexico. The ILS Proton Breeze M vehicle launched from Pad 39 at the Baikonur Cosmodrome at 01:07 today local time (19:07 GMT and 15:07 EDT on March 26). Utilizing a standard 5-burn Geostationary Transfer Orbit (GTO) mission design, the Breeze M successfully released the Satmex 8 satellite into orbit 9 hours and 13 minutes after launch. The satellite, built on the flight-proven 1300 platform, weighed nearly 5.5 metric tons at liftoff and was the 25th Space Systems/Loral (SSL) satellite launched on an ILS Proton rocket. This was also the first Satmex satellite launched by ILS and the first ILS Proton launch of the year. Satmex 8 adds 45% of total capacity over Satmex 5 which translates to 94% of increased capacity on Ku band to fulfill the growing demand for satellite services in the Americas. This was the 384th launch for Proton since its maiden flight in 1965 and the 78th ILS Proton launch. The Proton Breeze M vehicle was developed and built by Khrunichev Research and Production Space Center of Moscow, Russia’s premier space industry manufacturer and majority shareholder in ILS. “We want to thank Satmex for entrusting us with the launch of the Satmex 8 satellite. We also want to express our sincere appreciation for the ILS, Khrunichev, Satmex, and SSL teams for their tireless work in ensuring the mission’s success,” said ILS President Phil Slack.